Nationwide protests continue in the US, following the acquittal of George Zimmerman, with demonstrations hitting 100 cities on Saturday as people demand justice for Trayvon Martin, 17, who was shot dead by Zimmerman out of apparent self-defense. 22:13 GMT:Hundreds of people have marched in Sacramento calling for "Justice for Travon." 21:26 GMT: Trayvon Martin's cousing addressing the crowd in Seattle. 20:21 GMT: Justice for Travon rally in St. Louis. Signs, saying: “I am Trayvon Martin,” “Enough Is Enough” “Who's next?” were on display, with many people also singing hymns, praying and holding hands. 19:40 GMT: During a protest in Indianapolis, Pastor Jeffrey Johnson told 200 attendees that the nationwide 'Justice for Trayvon Martin' action is aimed at making life safer for young black men, who are still endangered by racial profiling. "The verdict freed George Zimmerman, but it condemned America more," a member of the board of directors of the National Action Network it cited as saying by AP. 19:11 GMT: Around a 1,000 people have participated in the Trayvon Martin rally, which concluded in Washington, DC, the US media reports. 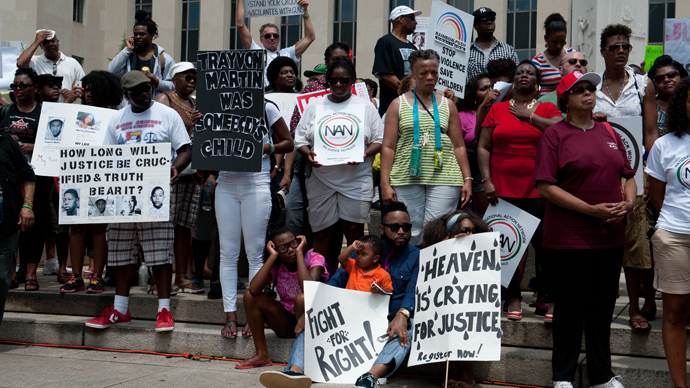 18:27 GMT: Up to 500 people have attended the 'Justice for Trayvon Martin' rally in Miami, organizers from Al Sharpton's National Action Network said. 18:02 GMT: The organizers of the Trayvon Martin rallies stressed that they want a peaceful action, without clashes and public disorder. 17:55 GMT:"I've got four beautiful daughters. I want them to look forward rather than behind their backs," Harlem resident Maria Lopez, 31, told Reuters during the Trayvon Martin rally in New York. 17:33 GMT: Thousands of 'Justice for Trayvon Martin' rally participants march across the Brooklyn Bridge in New York, Occupy Wall Street reports. 17:31 GMT: During his speech at the New York rally, protest organizer Reverend Al Sharpton said he wants the Justice Department to pursue a federal civil rights case against Zimmerman. "We are not coming out with violence, we are coming to denounce violence. The violence that was perpetrated against an unarmed, innocent man named Trayvon Martin," he stressed. “They need to change the laws that we all know need changing, because they don’t work for us,” she said. "Today it was my son. Tomorrow it might be yours," she warned. 17:24 GMT: Jacksonville, Florida has become one of the 100 American cities where a rally demanding justice for Trayvon Martin is taking place. 16:50 GMT: Trayvon's father, Tracy Martin, said he would be fighting to change Florida's Stand Your Ground laws as he attended a rally in Miami. "We will do everything we can to make sure there's change, that's our promise to our son's memory," he said. He stressed that he was "deeply touched" by the support he received since the acquittal verdict for Zimmerman last weekend, urging the demonstrators to “stand strong”. "Trayvon could have been anyone's child. That's the message that's being sent to the world," Martin added. 16:37 GMT: Pop-stars Beyonce and Jay Z have arrived for the ‘Justice for Trayvon Martin’ rally, taking place in the New York City. @MikePrysner This is the dumbest thing I've ever watched. And I've seen a lot. 21:10 GMT: During a speech to the NAACP on Tuesday, US Attorney General Eric Holder condemned “Stand Your Ground" laws while addressing the acquittal of George Zimmerman by a Florida court in the killing of Trayvon Martin. “These laws try to fix something that was never broken. The list of resulting tragedies is long and, unfortunately, has victimized too many who are innocent,” added Holder to applause from the audience. According to the Washington Post, over 30 states including Florida have passed “Stand Your Ground” legislation, which allows individuals to use deadly force if they feel they are in danger, or if a serious felony is about to be committed. Police in Sanford, Florida have previously noted that this law was partly behind their decision not to arrest Zimmerman after he shot and killed 17-year-old Martin, who was unarmed. Jurors also discussed Florida’s Stand Your Ground self-defense law before rendering their not guilty verdict in Zimmerman’s trial, according to one of the jurors who spoke anonymously to CNN’s Anderson Cooper on Monday night’s broadcast. 18:20 GMT: More than a dozen black preachers, led by controversial activist Al Sharpton, gathered outside the Department of Justice in Washington to announce that more than 100 demonstrations over the Zimmerman verdict will take place over the weekend. "People all over the country will gather to show that we are not having a two- or three-day anger fit," said Sharpton. "We don't need consolation. We need legislation, and we need some federal prosecution,." 07:30 GMT: Local media confirms that two people were injured and nine arrested in Oakland protest march on Monday. 07:24 GMT: Protesters still marching in Oakland. 06:53 GMT: The LAPD warns it has 300+ officers deployed and it will take a strict approach to people who come out to the Crenshaw area tomorrow. 06:40 GMT: More violence reported in Oakland as a masked protester attacked a waiter with a hammer-like object. 06:25 GMT: LA Mayor Eric Garcetti: "The Martin family didn't ask anybody to break car windows." 06:21 GMT: LAPD Chief Charles Beck: "This will not be allowed to continue". Beck spoke to the media after Zimmerman protest violence erupted. 06:19 GMT: LAPD confirms 13 people have been arrested. 06:17 GMT: 150 individuals broke away from other protesters and vandalized the city, the LAPD said. There were several instances of vandalism and a few assaults. 05:59 GMT: Conflicting reports on the ground that Oakland police deployed tear gas to disperse protesters. 05:51 GMT: Police have begun arresting protesters in Oakland, as reports come in about demonstrators attacking a local CBS crew. 05:44 GMT: Reports of Oakland protesters smashing windows and throwing rocks at media. 05:38 GMT: Thirteen protesters have reportedly been taken into custody by the LAPD. 05:33 GMT: A large group has been taken into custody in LA, local media reports. 05:30 GMT: Los Angeles police have begun arresting Zimmerman protesters after issuing a dispersal order and declaring the demonstration an unlawful assembly. 05:23 GMT: Reports of protesters gathered around a courthouse in Oakland, CA which is being guarded by police in riot gear. 05:20 GMT: Reports of LAPD gearing up and giving final warning to protesters before making arrests. 04:59 GMT: Los Angeles police have declared the Zimmerman protest to be an unlawful assembly. If demonstrators do not disperse, they may be arrested. 04:31 GMT: At least one fire has been started along Crenshaw Boulevard in Los Angeles, as Zimmerman protests turn violent. Reports of LAPD cruisers damaged, multiple trash cans burning. 04:30 GMT: Reports of FBI helicopters being deployed in LA. 04:25 GMT: LAPD fires bean bag rounds at Zimmerman protesters. 04:20 GMT: Los Angeles police declare citywide tactical alert as protesters burn American flag and loot local shops in southern part of the city, including a Wall Mart. 03:13 GMT: While the mass demonstrations are unlikely to result in a new trial for George Zimmerman, even under the Civil Rights jurisdiction of federal law, they have already succeeded in changing the conversation for the better, Professor Charles Rose, who teaches Excellence in Trial Advocacy at Stetson University in Florida, told RT. “You could look at the glass as half-empty or half-full. I prefer to think that what it gets us in the United States to do is what we, as a nation of immigrants, always need to do, which is to talk about how we come together,” he said. “That issue of race is always present in the United States and it gives us an opportunity, once the emotion has run out, to give us a way to talk about this in a way that can be positive for the country in the long term." 01:05 GMT: New Yorkers continued to protest the Zimmerman verdict Monday night, with hundreds marching from Union Square to Times Square. RT’s Marina Portnaya, reporting live on the scene, estimated that police outnumbered demonstrators 2:1 and, while no arrests were made, the marchers made their presence known. 18:00 GMT: US Attorney General Eric Holder confirmed that the Department of Justice is continuing to investigate the Trayvon Martin case. At the same time, Holder told a convention of Delta Sigma Theta that "Independent of the legal determination that will be made, I believe that this tragedy provides yet another opportunity for our nation to speak honestly about the complicated and emotionally charged issues that this case has raised." WH/Jay Carney says Pres Obama not involving himself in decision on whether Justice Dept will pursue civil rights charges against Zimmerman. 15:28 GMT: An image has gone viral of slain civil rights leader Dr. Martin Luther King, Jr. adorned in a hooded sweatshirt similar to the one worn by Trayvon Martin on the night of his death. A copy of the image posted to Twitter by former Obama administration advisor Van Jones has been retweeted over 1,500 times and has been attributed to artist Nikkolas Smith. “The Dream will never die. It is more powerful than fear or violence. It can never be swindled away or destroyed. It is one of Love, and therefore timeless,” Smith says on his website. 14:22 GMT: The Los Angeles Police Department has halted a citywide tactical alert put in place following Saturday’s verdict. The Los Angeles Times reported that upwards of 100 LAPD officers in riot gear were deployed the evening before in order to deal with an unruly crowd of around 80 protesters. The event ended in six arrests, the Times reported. 06:40 GMT: Oakland police declared protests following Zimmerman’s acquittal to be unlawful assembly, according to local media. 05:56 GMT: Oakland police is telling protesters to disperse as the crowd throws rocks, local media reported. 04:22 GMT: Los Angeles police are still on full tactical alert. A Zimmerman verdict protest in Los Angeles has turned violent, with police firing bean bag rounds, the LA Times reports. LAPD Cmdr. Andy Smith said some demonstrators threw rocks and D-cell batteries at police near the corner of Washington Boulevard and 10th Avenue. 04:00 GMT: New York police reportedly arrested around 20 people in Sunday’s protests. 03:15 GMT: Protesters in Oakland, CA have burned American flag. NYPD arrest 5 people participating in the #JusticeForTrayvon rally. Crowd is at E79th & 2nd Avenue. Ppl are getting rowdy. 01:58 GMT: RT’s Ramon Galindo reports that demonstrators protesting the acquittal of George Zimmerman have shut down the I-10 interstate highway in Los Angeles. 01:16 GMT: Watch the report on the NYC march for Trayvon Martin by RT's Marina Portnaya. 00:20 GMT: Huge crowds protesting the Zimmerman verdict are marching in Midtown Manhattan, RT’s Marina Portnaya reports from New York. The demonstrators have walked into the streets, blocking traffic. The crowd is chanting: "Off the sidewalks. Into the streets." 23:50 GMT: The petition to launch a civil rights case against Zimmerman by the Justice Department has collected close to 177,000 signatures, with a goal of 200,000. 23:18 GMT:The video posted on YouTube shows scuffles between police and protesters who marched for Trayvon Martin in Los Angeles. Gunfire could be heard in the background of the spontaneous rally, which took place the night the verdict was announced. 21:44 GMT:Close friends of George Zimmerman have told Reuters that following the acquittal he may go to law school to help other people like him. Zimmerman’s defense witness, John Donnelly, and his wife, Leanne Benjamin, got to know Zimmerman in 2004 when he and an African-American friend opened an insurance office in a Florida building where Benjamin worked. "Everybody said he was a cop-wannabe but he's interested in law," Benjamin said. "He sees it as a potential path forward to help other people like himself." 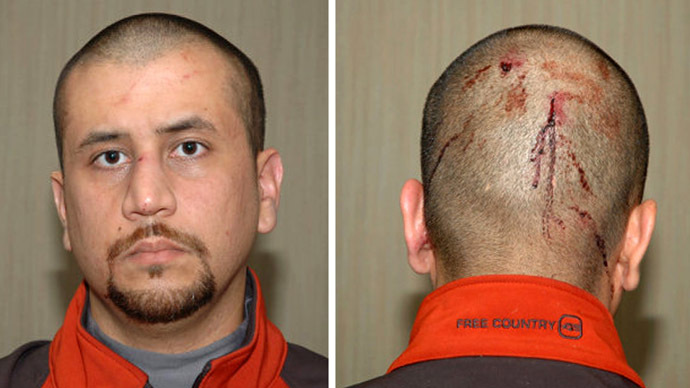 "I'd like to help other people like me," Zimmerman told the couple, according to Benjamin. 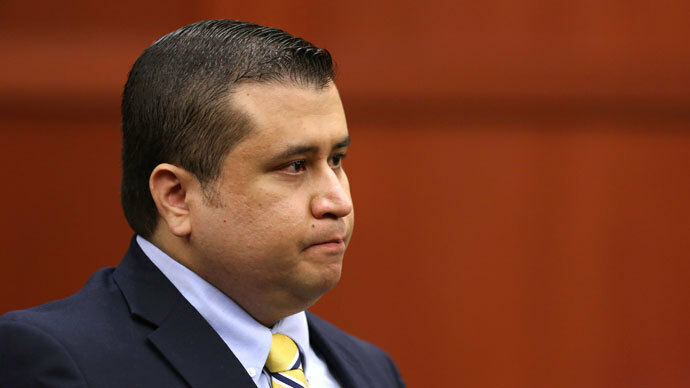 20:36 GMT:The US Justice Department is evaluating whether it has enough evidence to support further prosecution of George Zimmerman in federal court, and whether it can do so after Zimmerman was acquitted. "Experienced federal prosecutors will determine whether the evidence reveals a prosecutable violation of any of the limited federal criminal civil rights statutes within our jurisdiction and whether federal prosecution is appropriate in accordance with the department's policy governing successive federal prosecution following a state trial," a Justice Department spokesman said in a statement on Sunday. 19:18 GMT:Barack Obama has urged Americans to respect the verdict of the jury which cleared George Zimmerman of the murder of African-American teenager Trayvon Martin, as the US faces a second day of protests against the acquittal. “I know this case has elicited strong passions. And in the wake of the verdict, I know those passions may be running even higher. But we are a nation of laws, and a jury has spoken,” the US President said in a statement. 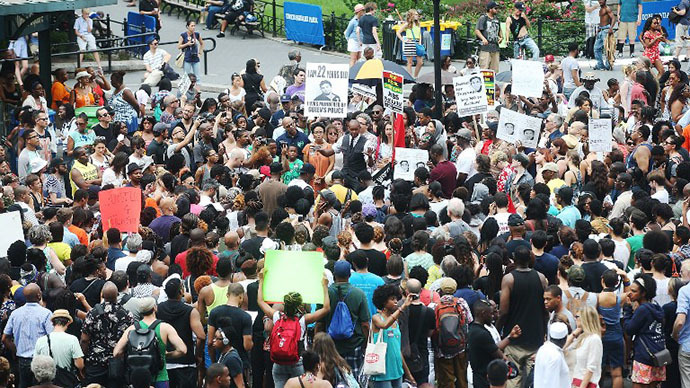 18:55 GMT:Hundreds of people have gathered in New York’s Union Square to protest against George Zimmerman’s ‘not guilty’ verdict. 18:25 GMT:Several hundred people have flooded Chicago’s Daley Plaza to protest George Zimmerman’s acquittal by a Florida jury. 17:46 GMT:Dozens of people are gathering on the streets of Oakland to protest the jury’s acquittal of George Zimmerman in the death of Trayvon Martin, AP reports. 17:12 GMT:A second day of protests has been scheduled countrywide for Sunday, with New York, California and Florida earmarked as rally points. "We're going to raise our voices against the root causes of this kind of tragedy,"Rev. Jacqueline Lewis of Middle Collegiate Church in Manhattan told her congregation. 09:00 GMT: Protests were also reported in Atlanta and Philadelphia. 08:52 GMT:Protesters turned violent in Oakland, CA, smashing shop windows and overturning trash cans. Demonstrators also spray painted anti-police graffiti on cars and buildings. No arrests have reportedly been made. 08:50 GMT: Reports of police firing bean bags at about 100 protesters in Los Angeles near the neighborhood of Crenshaw. Police say there was dispersal order. I got to scene several minutes before rubber bullets were fired & heard no order before getting hit. 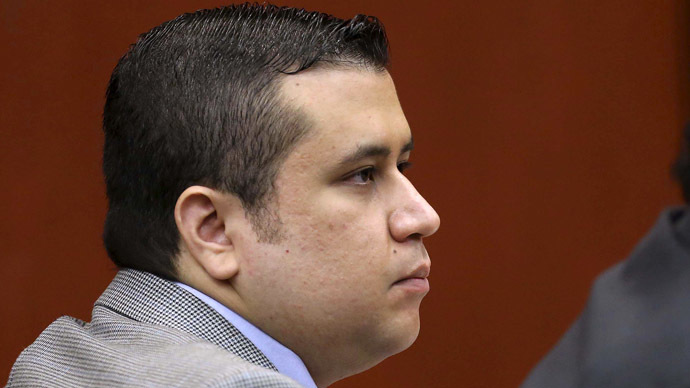 08:40 GMT: Read more about Zimmerman’s acquittal here. 08:34 GMT: Zimmerman’s defense attorney Mark O'Mara pointed out that his client’s safety would be an ongoing concern, as society still wants revenge for Martin's killing. 07:10 GMT: Los Angeles police issued a citywide tactical alert after about 200 protesters gathered in Leimert Park, the city's historically black neighborhood, LA Times cited police authorities as saying. 07:00 GMT: Protesters had started fires and smashed police cars and shop windows in Oakland, California. They also reportedly burned an American and a California state flag. 06:55 GMT: 13 police cars have been keeping watch as crowd of protesters listened to speeches following the outcry after the acquittal of George Zimmerman. 06:52 GMT: Find out more about nationwide protests here. 06:45 GMT: Protesters have marched in Washington, DC, airing their disappointment over Zimmerman’s acquittal. 06:30 GMT: Several hundred protests have gathered all day Saturday outside the courthouse in Sanford, Florida.